Maybe you would be interested in being a sponsor or partnering with PSIA-AASI Eastern Division? 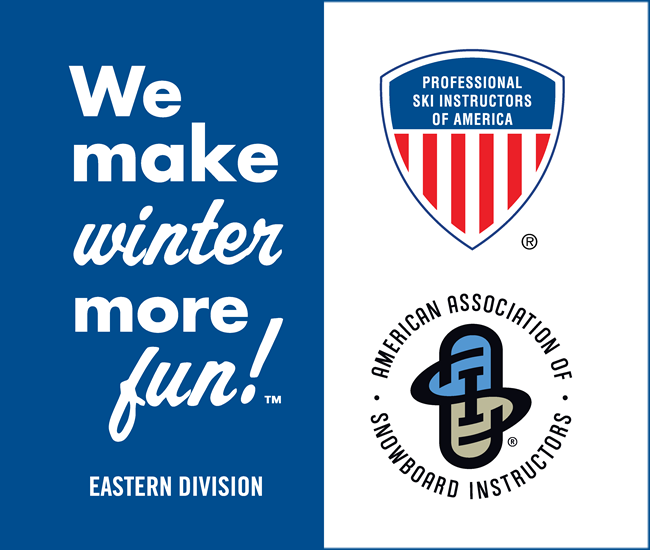 With more than 10,000 members, the Eastern Division of the Professional Ski Instructors of America (PSIA-E) and the American Association of Snowboard Instructors (AASI) is the largest of the eight divisions that make up the American Snowsports Education Association (ASEA, the national umbrella organization of PSIA and AASI). PSIA-AASI Eastern Division members represent nearly 32% of the more than 32,000 ASEA members across the country. 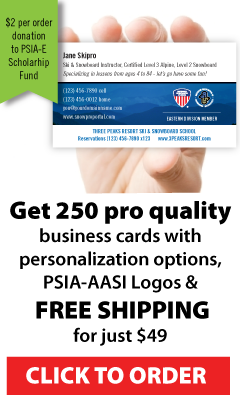 PSIA-AASI E also works with more than 250 affiliated Eastern Division Snowsports schools and their management teams. Our members live and work in seven regions up and down the East Coast, teaching for these affiliated snowsports schools/resorts. Eastern Division members represent a cross section of the East Coast population ranging from full-time snowsports instructors to professionals such as business executives, doctors, lawyers, and academic teachers. The majority are part-time instructors who come from many different backgrounds, geographic areas, age groups and income brackets. Most are also year-round outdoor sports and health enthusiasts who are viewed as ambassadors for snowsports safety and a positive, healthy lifestyle. We have approximately 200 Educational Staff employees who conduct our member clinics and exams at the more than 500 events we hold each season at various snowsports resorts throughout the east coast. Our events range in size from large, 500+ attendees to smaller, 10 attendee events. PSIA-AASI Eastern Division also has an Education Foundation that is a 501(c)(3) organization. Each season the foundation awards over 100 scholarships to members wishing to further their education in alpine, adaptive, Children’s, snowboard and nordic education. PSIA-AASI Eastern Division publishes the award-winning Snow Pro newsletter. The average size of each issue is 40 pages, it is published 4 times a year, and the average circulation of each issue is more than 10,000. Snow Pro advertising opportunities are always available! The Eastern Division hosts a handful of feature events each year, a few of which offer popular sponsorship opportunities. Click here for sponsorship information on the Snowsports School Management Seminar or the Snow Pro Jam/Master’s Academy. If you are interested in marketing a product or service to either our 10,000+ Eastern Division members and/or our 250+ affiliated Eastern Division schools and their management teams, our sponsor packages are flexible and range from event and other sponsorships, to promotional and advertising opportunities. To discuss our various opportunities and your specific needs, please call the Eastern Division office at (518) 452-6095.